Today’s semifinals at Stena Match Cup Sweden were held in perfect conditions with 25 knot winds, big seas and blazing sunshine. There have been few days when match racing as a spectator sport has been shown off so well. Marstrand’s natural sailing amphitheatre was rammed with friends, family, well wishers and corporate guests having to hang on to their hats as they were treated to a day of thrills, spills and high drama. “That was awesome - I loved it out there,” commented a beaming Phil Robertson. “It was massive, right on the limit, big seas as well, so great fun downwind. We were just having a ball.” His WAKA Racing team was the first to get its berth in tomorrow’s Final, going up 3-0 in its matches against Australia competitor Keith Swinton and his Black Swan Racing. 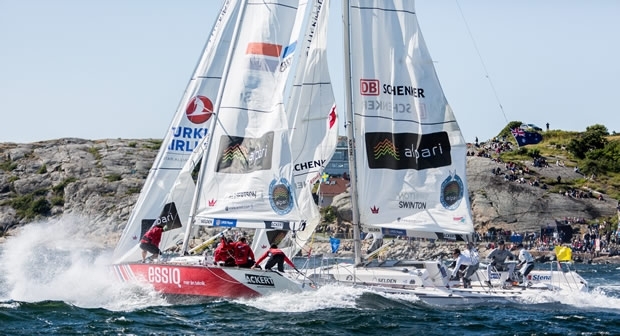 The dramatic conditions off Marstrand brought more drama in the other Semi-Final between local hero Bjorn Hansen and his eWork Sailing Team and Italian Simone Ferrarese. This Sweden versus Italy match went the full distance with Hansen claiming the first two matches, only for Ferrarese to claw back levelling the score. The Swedes came very close to scoring the final knock-out blow when he led around the course on race four, albeit with a penalty outstanding. He got suitably far ahead to knock off his penalty at the finish line only for disaster to strike. “We couldn’t get the spinnaker pole off – its end had broken,” explained Hansen. “It was stuck there. We couldn’t get it down. We were trying and trying and after five seconds you are 100m closer to the finish line and then everything got a bit late.” The boats crossed the finish line together with Ferrarese getting the point, Hansen having not completed his penalty because the head of the spinnaker hadn’t dropped below the boom gooseneck before he started to tack. In the fifth and deciding race, Hansen provided a match racing masterclass in the pre-start, with repeated dial-ups. Ferrarese picked up a penalty in one of these, then in a separate incident there was contact between the two boats that the umpires were unable to see and so penalised both parties. Finally Ferrarese picked up a further penalty en route to the start line. With Hansen already in the better position off the start line, Ferrarese carried out a penalty turn immediately after the start and from then on was on the back foot. The Italian team was unable to catch up and while Hansen picked up the vital deciding point and his place in the final, Ferrarese broached while passing the leeward gate and managed to hook the leeward mark, which, now airborne, they dragged down through the finish line and on. “We’d lost the Semi-Finals and we wanted to take something home!” quipped the Italian skipper.